Location was great, very close walking distance to everything including the train, which was easy to catch. Close to Circular Quay. Apartment was a good size for a family, spacious. Everything we needed was there. Bit later checkout time was awesome. Excellent location, large room and balcony, kitchenette, in-room laundry. Excellent location and the apartment was very spacious with everything needed if you were there for a long term stay. Easy walk to the ferries,buses and trains. Would be our first choice to stay next time in Sydney. The overall size of the apartment was great with appliances (though dated) made it a nice home away from home. Great location where you could walk to most things in the city and very spacious. The facilities were good and apartment was well equipped. Serviced every day and staff most helpful. Enjoyed the easy city access. This was my first stay and I will come back. Also appreciated the flexibility with parking exit in the morning. Room was comfortable and had every convenience. Bed was very comfortable and warm. Great location and room was clean and spacious. Easy to access hotel and car park straight off the harbour bridge. We have stayed here before and would stay here again. Lock in a great price for The York by Swiss-Belhotel – rated 8.3 by recent guests! The York by Swiss-Belhotel This rating is a reflection of how the property compares to the industry standard when it comes to price, facilities and services available. It's based on a self-evaluation by the property. Use this rating to help choose your stay! 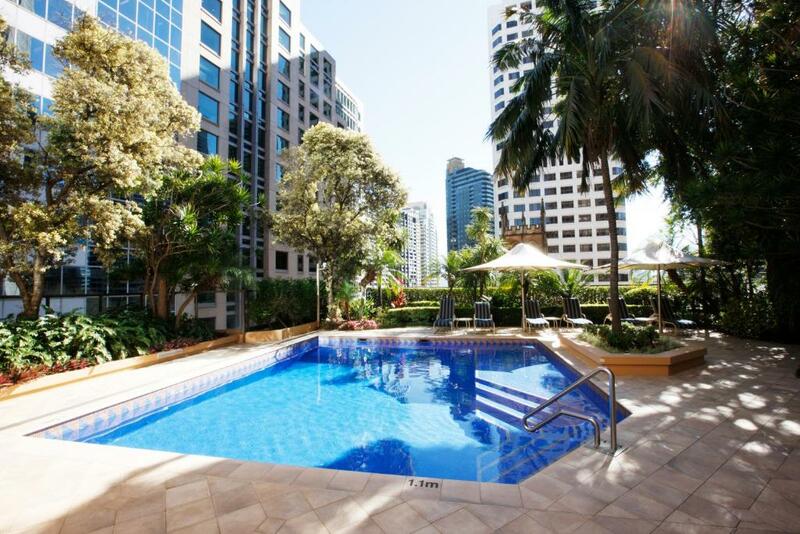 One of our top picks in Sydney.Located in the heart of Sydney CBD (Central Business District), The York by Swiss-Belhotel offers air-conditioned apartments with a private balcony and free WiFi. Guests have access to a fitness center and heated outdoor pool. Each apartment at The York offers a spacious living area, fully equipped kitchen, 1 or 2 bathrooms and laundry facilities. The 6th floor garden oasis features sun loungers, plus a sauna and hot tub. There are 2 restaurants adjacent to the hotel serving Asian cuisines. The York by Swiss-Belhotel is less than 10 minutes’ walk from Circular Quay, The Rocks and Sydney Harbor. It is a 10-minute walk to Darling Harbor and Wynyard Railway Station is only 2 minutes’ walk away. When would you like to stay at The York by Swiss-Belhotel? This spacious, open-plan studio features a private balcony and a combined lounge, dining and sleeping area offering kitchen and laundry facilities. It is fully furnished, air-conditioned and receives daily servicing. This spacious suite offers a private balcony, a fully equipped kitchen, a lounge and dining area and 1 bathroom. It is fully furnished, air-conditioned and receives daily servicing. This spacious apartment offers a private balcony, a fully equipped kitchen, a lounge and a dining area. It is fully furnished, air-conditioned and receives daily servicing. The second bedroom bedding configuration can be either a double bed or twin beds, based upon request to the property. This spacious suite features a balcony, a fully equipped kitchen, a lounge/dining area, laundry facilities and 2 bathrooms. It receives daily servicing. There is a queen-sized bed in 1 bedroom and 1 double-sized bed or 2 single-sized beds in the 2nd bedroom. To request your preferred bedding configuration, please use the special request box when booking or contact the property using the contact details found on the booking confirmation. Features a kitchen, lounge/dining area, 2 bathrooms, laundry facilities and a balcony. It is fully furnished, air-conditioned and receives daily servicing. Please note that the price is based on 4 guests. Maximum occupancy is 5. This open-plan studio features a private balcony and a combined lounge, dining and sleeping area offering kitchen and laundry facilities. It is fully furnished, air-conditioned and receives daily servicing. Please note that this apartment has not been refurbished. This apartment features a balcony, a fully equipped kitchen, a dining room and a lounge area. There are 2 bathrooms and laundry facilities are provided. The York Sydney Serviced Apartments by Swiss-Belhotel is the perfect choice for serviced apartments in Sydney. Enjoy the convenience of our short stay or long term serviced apartments suiting both business and leisure trips in Sydney. With 120 suites ranging from Studio Apartments to Three Bedroom Executive Apartments, The York Sydney Serviced Apartments by Swiss-Belhotel offers a home away from home complete with fully equipped kitchen, laundry, separate bath and shower, open plan lounge and dining area and spacious open air balconies. Suites are serviced daily. The York Sydney Serviced Apartments by Swiss-Belhotel is within a 5-10 minute walk to major Sydney attractions like the Sydney Harbour bridge and the Sydney Opera house. Perfectly located for cruises daily boat trips while being at the centre of the shopping district. House Rules The York by Swiss-Belhotel takes special requests – add in the next step! The York by Swiss-Belhotel accepts these cards and reserves the right to temporarily hold an amount prior to arrival. Please note that the car park has a height restriction of 6 feet for all vehicles. Bathroom could do with some reno- looks like they might even be in the middle of a revamp as some areas of the hotel are looking very fresh and new! Room was lovely, perfect for what we needed. Bed was comfortable, staff very friendly! Loved the little touches like the coffee machine in the foyer! Parking was good and safe. Would stay again. The air conditioners in the unit are very old and need to be replaced. For my needs it was ideal. The staff particularly were always very helpful and friendly and approachable. In fact I cannot fault it and will be staying again when I am next in Sydney. It was very dated..worn out carpets ..shocking shower .certainly was not four star. Was in good position. Staff were very helpful and friendly. The swimming pool was very cold. Maybe that's an Australian preference, but I found it too cold to swim. Also, in charging my credit card in advance, the clerk input my card with a wrong expiry date causing it to be declined, and resulting in a lengthy long-distance call to Canada to resolve what turned out to be a local error. Human error, but frustrating. I was disappointed by the standard of cleanliness - mainly the things that need less frequent cleaning, e.g. cupboard and door handles, switches, grouting, shelves and drawers. More distressingly, two staff members were very rude to me, first when I asked (politely) about the checkout policy ($20 charge per half hour for check-out after 10.30 a.m.) and second when I inquired as to why I had received conflicting information regarding the security deposit. I can forgive most things when travelling, but not rudeness. Excellent location and facilities, very convenient for a stay in Sydney when you don't want to dine out every meal. We booked on behalf of our friends and their apartment was refurbished with plush carpet and a king size bed and our apartment was well used with industrial carpet and. a very light double bed. Luck of availability. Very friendly and helpful reception staff. Close to Wynyard station where also woolworths and specialty shops are located. Late checkout available and free wi-fi and units have modern appliances. Great water pressure in shower! The room that we were booked into was a bit out dated and tired. Our friend's on the same bookings got upgrade. After talking to the friendly staff the next day we also got upgraded to a new room next to our friends, which my wife enjoyed as she was not well and spent most of the days in the room we had booked a 5 day stay. Booked for 5 but arrived to apartment for 4 staff kindly brought in an extra bed. Properties are all individually owned but managed by Bel-Hotel so the apt we were in was very dated and badly laid out even the staff commented on it being so when they brought the extra bed for us. Great location for opera house/harbour bridge CBD. Staff very helpful.